Used for appliqué, sewing ribbon in place, and securing binding, blanket stitching adds texture (and sometimes color), to the edge of your fabric, ribbon, or appliqué. Position the edge along the inside toe of the foot and adjust the needle position all the way to the left or right, depending on how you have positioned your fabric. The need will drop just outside the edge, sewing into the background fabric for the vertical (forward) part of the stitch and will “bite” into the fabric, ribbon, or appliqué with the horizontal (sideways) portion of the stitch. It’s easy to have perfect stitching as long as you keep the edge next to the inside of the presser foot toe. It’s simple to make sure your stitching is parallel to the edge, again using the inside toe of Open Embroidery Foot #20 as a guide. Align the fabric edge next to the inside toe of the foot and adjust the needle position so that stitching is the desired distance away from the edge. 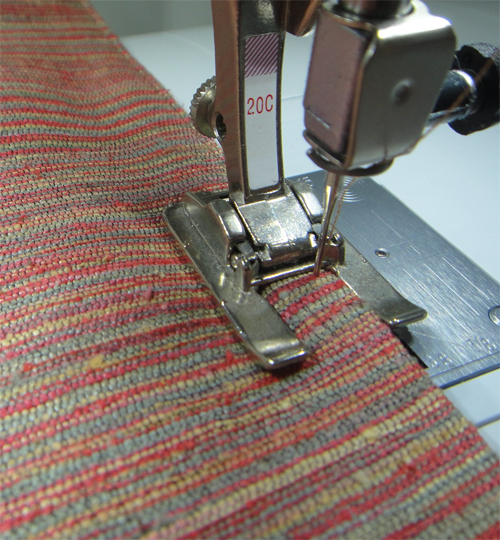 Keep the fabric edge next to the toe and the stitching will be parallel to the edge. Great for pocket edges! The wedge-shaped indentation in the sole of Open Embroidery Foot #20 allows decorative stitches to move under the foot easily and smoothly without dragging on the thread that builds up as the stitches form. 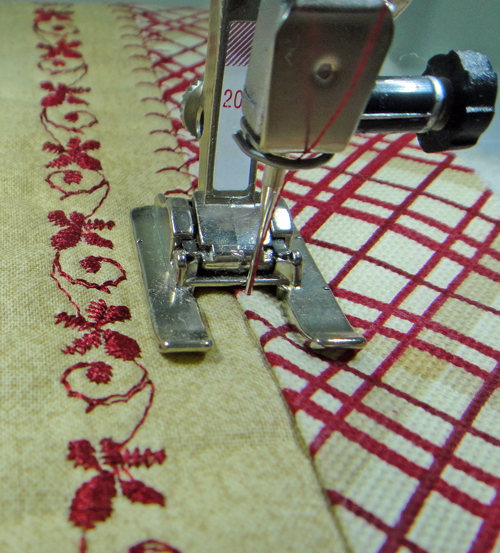 The open front of the foot makes it easy to place the stitch precisely, such as when following a seam line. I have a Bernina 380 (James is just over a year old now — I name my machines, and this sleek and powerful machine reminds me of James Bond in one of his action flicks.) I have purchased several feet and attachments for my 380. The most used and useful one has to be the #20 open toe foot. Love it for its versatility. My new find among the feet has to be the #35 invisible zipper foot — I am making a bag using cotton fabrics that has a zippered closing. I usually have to take out one side of the zipper when I am installing it –not this time. The zipper coil seated nicely into the grooves of the metal foot and I think the sturdiness of the metal foot kept the zipper coil where it was supposed to be. 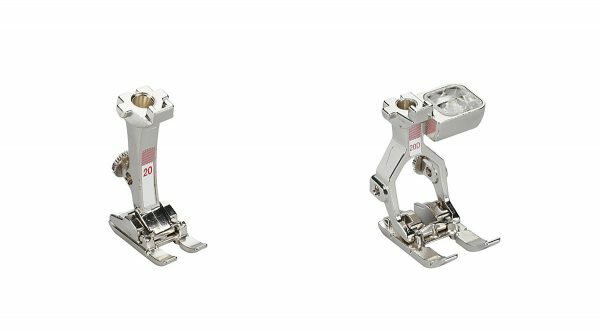 Bring on more illustrations of the Bernina feet and their varied uses. Love that you named your machine! And I love the name. Maybe we could introduce James to Nina (my baby) and see what happens!! I have this foot and now I cannot wait to give it a try! Thanks for sharing these ideas. 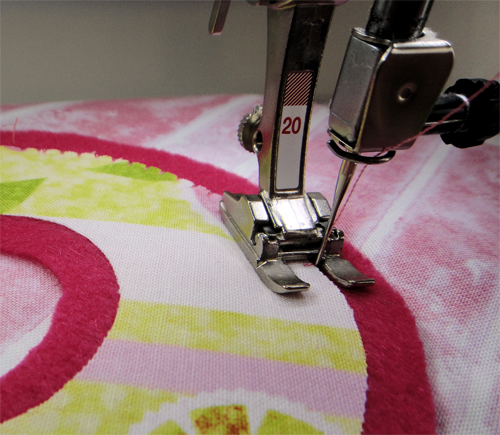 I love the idea of actually being able to see where my needle is (at all times) while I am sewing. Nina (my machine’s name – like wpb52 I name my helpers) will really enjoy taking her foot for a spin. I love the advice about the feet. I tend to always use the same one but forget what the others are for. May I ask what is the difference between the 20,20c 20d?